We are committed to providing quality fiberglass pools for customers who are looking for low maintenance and built-in features, and are proud to recommend Trilogy, Viking & Blue Hawaiian fiberglass pools as part of our partnership with Latham Pool Products. Choose from a variety of colors, finishes, water features, decorative tile and lighting options for a backyard pool that is uniquely yours. Looking to extend your living space? Add a custom spa or fiberglass ledge. You won’t want to go back inside! 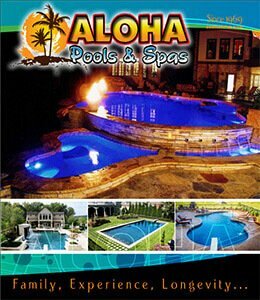 Get Started with Our Aloha Pools & Spas Brochure to See the Many Types of Inground Pools We Offer! Visit our full website, AlohaPoolsUSA, for more options for your pool, spa, outdoor living, and more! Please call 502-369-7665 or complete the form below and we will be in contact shortly.